Find Better Ideas, Faster ® with a custom pump trend report, our PRO Dashboard and 80+ categories of premium trend reports. The Pump Trend Report examines a wide range of generic and designer shoes for women, from high heels to stiletto wedges, that have captivated fashionistas everywhere. Over the past year, there has been much change in the fashion industry due to the economy. However, through our research we have noticed trends in female footwear -- like leopard print pumps, red heels and solid black pumps -- that are still popular among consumers. These trends, along with many other key factors, are creating new and emerging patterns in ladies footwear that can be converted into profit for well-informed businesses. Shoemakers, fashion designers, photographers, style watchers and personal stylists can benefit greatly from our data due to the fact that our content is generated from fashion-minded consumers. Furthermore, our crowd-sourced content will assist fashion marketers and advertisers with campaigns, products and promotions that can be tailored to the preferences of fashion consumers and tastemakers. 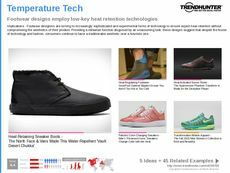 The Pump Trend Report is your guide to the shoe trends shaping consumer appeal, and can make you more of a competitive force in the footwear industry with newfound insight.